The Velveteen Rabbit or How Toys Become Real By Margery Williams illustrations by William Nicholson Children's Classics The Velveteen Rabbit (or How Toys Become Real) is a children's novel written by Margery Williams and illustrated by William Nicholson. It chronicles the story of a stuffed rabbit and his quest to become real through the love of his owner. The book was first published in 1922 and has been republished many times since. The Velveteen Rabbit was Williams' first children's book. It has been awarded the IRA/CBC Children's Choice award. Based on a 2007 online poll, the National Education Association named the book one of its "Teachers' Top 100 Books for Children." A stuffed rabbit sewn from velveteen is given as a Christmas present to a small boy, but is neglected for toys of higher quality or function, which shun him in response. 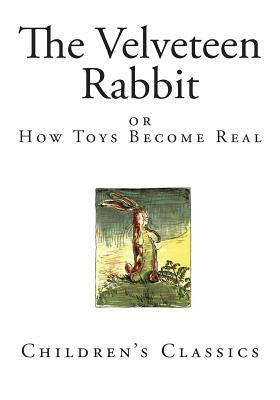 The rabbit is informed of magically becoming Real by the wisest and oldest toy in the nursery as a result of extreme adoration and love from children, and he is awed by this concept; however, his chances of achieving this wish are slight. One night, after the boy has misplaced his cherished china dog, he is pacified through the presence of the rabbit, who attracts more attention from his owner from then onward as a result, to the extent of his promotion to the position of the child's favorite toy. However, when the toy rabbit's owner contracts scarlet fever, he is prescribed a trip to the seashore and is pacified upon receiving a stuffed rabbit of higher quality as a replacement for the Velveteen Rabbit, which must be burned alongside all of the other playthings due to potential bacteria. Before the rabbit can meet a painful demise, he is greeted by the Nursery Fairy, who transforms him into a living rabbit to spare him from an agonizing fate, as he'd acquired greater affection from the boy than all of the other toys and surpassed all qualifications required. The rabbit accompanies several others in rejoicing, gleeful upon having received his dream. Margery Williams Bianco (22 July 1881 - 4 September 1944) was an English-American author, primarily of popular children's books. A professional writer since the age of nineteen, she achieved lasting fame at forty-one with the 1922 publication of the classic that is her best-known work, The Velveteen Rabbit.